Kelli Willard (center back) and her husband James (far left) watch as friends pack shoeboxes at a party last year. Following a miscarriage, one woman found joy by packing shoeboxes for Operation Christmas Child. Kelli Willard still tears up when she remembers the loss of their unborn child in 2011. After waiting eight years to have children, she and her husband James grieved when Kelli’s pregnancy ended after two months. 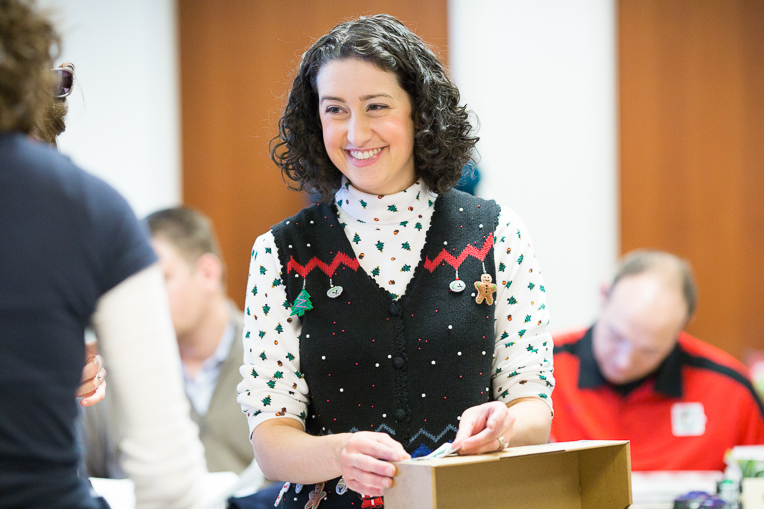 Kelli Willard smiles as she packs Operation Christmas Child shoeboxes. As a marriage and family therapist, Kelli knew that isolation often follows grief, loss, or trauma. Seeing this in herself, she decided to take her own advice and “connect with something bigger than herself.” Feeling alone, she wanted to join others in doing something joyful, because despite the pain, life still held beauty. She chose to pack gift-filled shoeboxes through Operation Christmas Child, a project of Samaritan’s Purse. “When I was sad, I would wrap a box, and, as I’d wrap a box, I’d smile,” said Kelli. Praying as she did so, Kelli would ask God to meet the child who received the box in the midst of his or her own pain, whatever that was. “That year my boxes were beautiful,” said Kelli. She wrapped them carefully with coordinating tape and decorated them with stickers. But even more care went into the letters she enclosed. She wrote about hope for joy and change, telling the children how cherished and valuable they were to their Father God. Never before had she realized how much God loved his children. “It really hit home to me how much love you can have in your heart for your unborn children. That was my first taste of motherhood,” said Kelli. She sought to convey that level of love and affection to the children who would receive her shoebox gifts. Operation Christmas Child allowed her to do just that and as Kelli said, “It allowed me to connect with the second pregnancy.” Two months following her miscarriage, she conceived her son, Jarett. Overcome with gratitude, Kelli began asking God how she could say ‘thank you’ for her healthy pregnancy. When she had a successful doctor’s appointment or ultrasound, she went shopping for Operation Christmas Child shoebox items to express her thanksgiving. Exploring the clearance shelves, she found quality items that would bring delight to children in need. Kelli’s gratitude continues today as she shops for Operation Christmas Child year-round with the help of her now 3-year-old Jarett. His 1-year-old sister Elina will also assist in time. For Kelli, Operation Christmas Child has become her social life, connecting her to other mothers who are also shopping throughout the year for shoebox items. This can be seen in the 200 friends who follow her Operation Christmas Child Facebook group where she shares deals and publicly thanks people who contribute items. Shoebox packers smile at a party organized by Kelli last year. In 2013, Kelli organized a shoebox packing party that packed 200 boxes, but since it overtook their home, her husband offered to get his company involved the next year. Byteworks, an information technology company with 13 employees, occupied an entire floor of an office complex in Duluth, Georgia. Their 11,200 square-foot office seemed an ideal solution when the Willard’s increased their goal to 1,000 boxes in 2014. Byteworks had the space to store shoebox items and to host the packing party, but for James their involvement meant more than that. Throughout that year as they planned for this event, Kelli saw concrete prayers answered like never before. She didn’t know where she would get 1,000 shoeboxes or how to transport the packed boxes to the drop-off location, but people approached her with solutions. She found she would just think of a need for more lollipops, for example, and someone would call to offer her that very thing. As more than 50 people gathered at Byteworks for a six-hour packing party in 2014, Kelli was at a loss for words—an unusual occurrence. She was overcome with emotion because people made a personal investment of time and money to contribute to this Samaritan’s Purse project that is near to her heart. 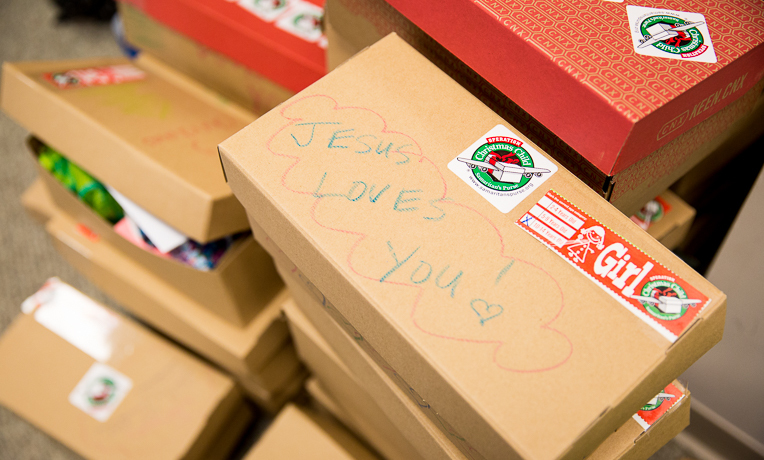 By 4:00 p.m. that afternoon, 1,038 shoeboxes were filled with gifts.